Home > Games	> New Kindle apps! Games and a Study Tool! New Kindle apps! Games and a Study Tool! ‘Essential Word Search (A Word Game for Kindle)‘ by Runestone Games Limited is available on the Amazon Kindle site for $0.99. Just click here to download! Play this classic pen and paper game on your Kindle! Find all of the words that are hidden in the grid of letters. The hidden words can be found horizontally, vertically and diagonally and can go forwards or backwards. 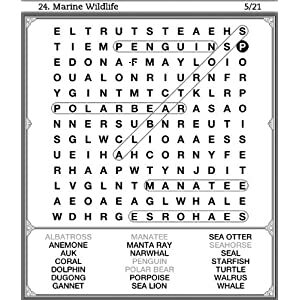 A word search can be paused and resumed at any time, and the player’s progress on any incomplete puzzles will be saved. * Contains 50 themed word searches across 10 categories, such as Fame & Fortune, Animal Kingdom, Knowledge & Science and Our World, with over 900 words that need to be found, providing hours of fun. * Play a leisurely game at your own pace or challenge your keen eye-sight by playing against the clock. * Easy Controls: Use the 5-Way to navigate the grid and select the first and last letter of a word to mark it. If the marked word has been correctly found, it will be circled in the grid and greyed out in the word list. * Puzzles can be reset, allowing a puzzle to replayed any number of times. ‘World Word Search (A Word Game for Kindle)‘ by Oak Systems Leisure Software is available on the Amazon Kindle site for $0.99. Just click here to download! 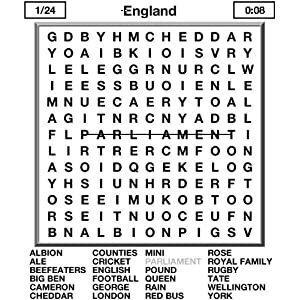 World Word Search includes 50 13×13 puzzles, each with a different country theme. There are cities, local food, languages, traditions and more to find in each puzzle. There is sure to be fun for all ages! Your goal is to locate and mark off words in the grid using the 5 way controller or the touch screen. Each word appears in a straight line, horizontally, vertically or diagonally in the grid – but be careful, sometimes the words are backwards! Play at your own pace or against the clock and see who can get the fastest time for each puzzle. Pause partway through a puzzle and return to where you left it. You can reset each puzzle and try it again as many times as you like. If you get stuck on a more challenging puzzle then you can give up and see the correct solution. People who like Word Searches will have a great time with this game on Kindle. ‘LINGO Genius Edition (A Hard Puzzle Game for Kindle Based on the TV Show)‘ by Route 1 Games is available on the Amazon Kindle site for $1.99. Just click here to download! The worldwide game show phenomenon has arrived on Kindle! OK Genius… If you watch LINGO on TV and think you can do better, it’s time to prove it! Each game features three full levels plus the Bonus LINGO round. That means hours and hours of game play for 1 or 2 Players. The 1 Player mode is perfect for brain training and the exciting 2 Player mode allows you to challenge friends and family. * Exit the game and save progress at any time. If you’re looking for a true mind-bending challenge, try LINGO Genius Edition! 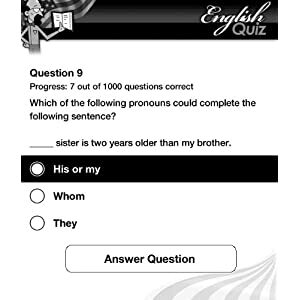 ‘Ultimate U.S. English Quiz (A US English language quiz for Kindle)‘ by HandyX is available on the Amazon Kindle site for $1.99. Just click here to download! 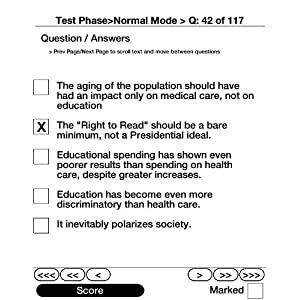 This is a quiz designed to test your knowledge of the US English langauge. Do you know the difference between your tyre and tire? Do you know how certain words came into the language? Everything you ever wanted to know about the US English language is encapsulated in 1000 well thought out multiple choice questions. This quiz will give any language novice the confidence to tackle the most complex of English language situations and help build a solid foundation for future improvement. ‘eReviewBook SAT Verbal (An Interactive Study Tool for Kindle)‘ by BrainMatriX is available on the Amazon Kindle site for $2.99. Just click here to download! eReviewBook SAT Verbal helps you quickly learn what you need to know for the Verbal section of the exam. The exercises are written by test prep experts to help you master the key concepts, and improve your reading and writing skills. eReviewBook gives you complete control over your study material so that you can dynamically create and edit questions, which gives you the power to personalize content and study more efficiently. eReviewBook offers four phases: Edit: to create or modify questions; Flash: to become familiar with new content; Test: to assess knowledge of a topic; and Review: to get feedback on the test assessment. Additionally, eReviewBook has multiple modes that allow tremendous flexibility in study approaches and methods. Try eReviewBook to get a more powerful study tool at a fraction of the cost (and weight) of a standard review book. *-SAT is a registered trademark of The College Board which was not involved in the production of, and does not endorse, this product. ‘House of Hell (A Fighting Fantasy Adventure)‘ by Worldweaver is available on the Amazon Kindle site for $3.99. Just click here to download! 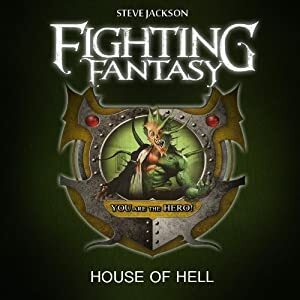 House of Hell brings an exciting installment of the popular game book series Fighting Fantasy by Steve Jackson and Ian Livingstone to Kindle.